The deadline to submit nominations for the 2015 ARRL International Humanitarian Award is December 31. The award is conferred upon an amateur or group of amateurs who demonstrate devotion to human welfare, peace and international understanding through Amateur Radio. The League established the annual prize to recognize Amateur Radio operators who have used ham radio to provide extraordinary service to others in times of crisis or disaster. A committee appointed by the Leagueâ€™s President recommends the award recipient(s) to the ARRL Board, which makes the final decision. The committee is now accepting nominations from Amateur Radio, governmental or other organizations that have benefited from extraordinary service rendered by an Amateur Radio operator or group. Amateur Radio is one of the few telecommunication services that allow people throughout the world from all walks of life to meet and talk with each other, thereby spreading goodwill across political boundaries. 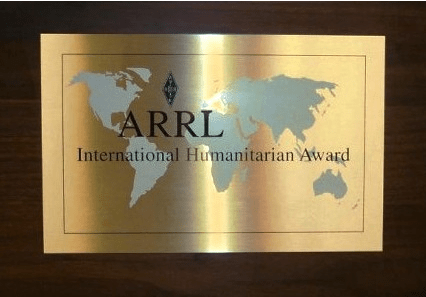 The ARRL International Humanitarian Award recognizes Amateur Radioâ€™s unique role in international communication and the assistance amateurs regularly provide to people in need. Nominations should include a summary of the nomineeâ€™s actions that qualify the individual (or individuals) for this award, plus verifying statements from at least two people having first-hand knowledge of the events warranting the nomination. These statements may be from an official of a group (for example, the American Red Cross, The Salvation Army, a local or state emergency management official) that benefited from the nomineeâ€™s particular Amateur Radio contribution. Nominations should include the names and addresses of all references. Nominations are due by December 31, 2015. In the event that no nominations are received, the committee itself may determine a recipient or decide to make no award.